You've got some neat innovation in here, making a puzzle game where you have to fight the physics and also grapple to surfaces. Also the squishing sounds were a nice touch. First off, I'd like to say that although this was made in Unity with 3D-rendered graphics, I was still able to play the game on my day job workstation, which has an integrated graphics chipset. No Bones still played great and wasn't laggy one bit. And so far, I've only played this during a break at my day job. There's a metaphor hidden in there somewhere. I kept thinking you had mis-categorized this as being for this event instead of the Liberal Anatomy Park Jam. I'll post my review of it just in case. I never knew I could be so oppressive to parts of my own body. What would happen if my heart suddenly decided to leave out? I began to think about how I associate to the bag of flesh and organs that surrounds "me," and what would happen if certain things just left. What would be left of "me?" 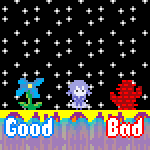 You roll across the featureless grey landscape in the final stage, and although it's obviously a struggle it's also a kind of pageant of your own destruction: "Look at what I am willing to tolerate." Even as you roll as close to straight forward as you can, your body still becomes malformed, distorted and altered by the unyielding landscape. By the time you're sitting next to the lava pool, you're a mangled mess simply waiting, powerless, close enough for the skeleton to notice you but not so close that you absently roll in and have to do it one more time yet again. Only to have the skeleton stop by and still tell you you're worthless. Then the game abruptly closes. Captain Jean-Luc Picard said: "It is possible to commit no mistakes and still lose. That is not a weakness. That is life." Well, fuuuuuuuck me. Dude must have played No Bones on archive dot org sometime in the distant future. This was not made for the Anatomy Park jam. I came up with the idea specifically for Slice of Life. It's more like a metaphorical slice of life rather than a literal one. Yeah, I liked it. I was first playing the game without sound, and I couldn't help but think of the Benny Hill soundtrack playing in the background, or the trombone/tube version of "Rudolph the Red-Nosed Reindeer." There was something altogether slap-sticky about those first moments of playing the game. Of course, the character of the game changes as you continue and realize the skeleton's abuse is relentless, and the levels really are challenging. It makes me think of what abused spouses must go through every day. What a horrible experience. That last level was the most dreadful... "I'm gonna make it, but do I really want to? Will the skeleton cut me a break, or will it be more of the same?" Of course, being delusional you think things will change, but there's really no impetus for them to. Wow. Thanks for making this game for the Slice of Life event, ihavefivehat! It made me think, particularly beyond the world of the game. I was rooting for the skeleton. Meat needs to find someone who appreciates them rather than demanding that an oppressive dependency exist that in reality is only traditional symbol that Meat benefits from. Actually, I don't think that metaphor holds up because it ignores the symbols in the game and the containment of their interactions. 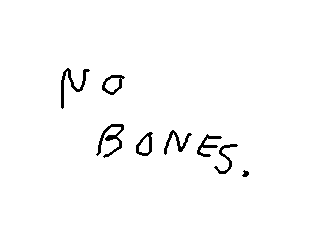 I don't think of it so much as Skeleton leaving, but instead that Skeleton and Meat have a necessary proximity to each other , but that Skeleton refuses to cooperate with Meat due to Meat's softness.